First is one of those pretty not-white-but-still-pretty-darn-pale tones that is Essie Urban Jungle. This is seriously beautiful on the nails and looks chic, but not stark as white often can. It leans a little bit pink too, for those who like things a touch girly. 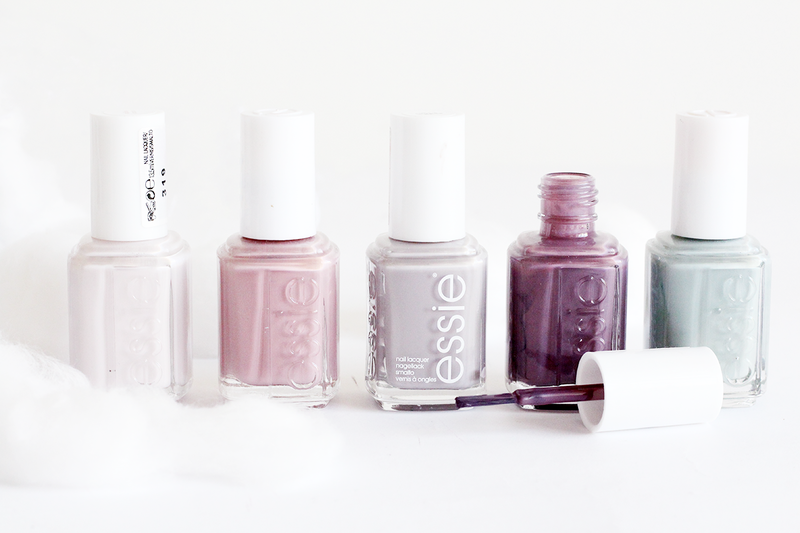 Next is a long term favourite by the name of Essie Lady Like. It’s one of those pretty muted dusty pink shades which is perfect in two coats. I always wear this when I can’t decide what to wear, as it’s such a classic in my collection. A slightly darker shade comes next and that’s Essie Merino Cool. Although not a typical ‘Spring’ shade, I still think it branches out into that category just by how pretty it is on the nails. It’s a mid-tone, ashy purple and looks beautiful with two coats applied. Finally, moving away from the purples and greys, Essie Maximillian Strasse-Her is one of those shades that’s been raved about in blog world for quite a while. It’s a pretty blend of grey and green, which makes for a muted seafoam kinda shade. If you don’t like mint or those grass green pastels – this is perfect for you! What are your favourite Spring nail shades? Don’t forget to enter my USA beauty giveaway!